A possible link to 34 Albury St & Lord Nelson? In 1913 the Deptford Fund Hospital for Sick Children was founded by Her Royal Highness, Princess Alice, the Countess of Athlone, (The Duchess of Albany's daughter). Two houses were purchased 34-36 Albury Street, (photo No. 36 Albury Atreet) just behind the Albany Institute. 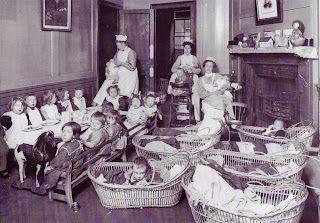 The hospital was to provide treatment for babies of Deptford and Greenwich area who were not eligible for treatment at other hospitals. In 1930 the whole building was flooded during a bad storm and the babies were hastily rescued from the building and taken into the institute. When they returned to the hospital, the top storey of the houses had to remain empty due to a lack of money to repair the storm damaged roof. Because of this in 1932 the Albany institute was forced to sell the houses together with, and I quote, "Nelson Relics". It appears that Nelson may have stayed at the house at times during the last 5 years of his life. To raise as much money as they could the Albany Institute sold the relics namely, the rear door of the property which was reported as being the Hatch Door from HMS Victory and a chain from the front door which it was said came from Nelson's own locker on the same ship. The Deptford Fund contemplated building a new hospital not far from the two houses near the institute but the authorities viewed the area as undesirable and said they would be far more readier to give financial help if the new hospital was built on a higher and healthier site within the borough. In 1933 the Deptford Fund Babies Hospital moved from Albury Street to 25 Breakspears Road Brockley. Princess Alice Countess of Athlone has presented a site to the Deptford Fund for the purpose of extending the Hospital for Sick Babies. The gift is to serve the dual purpose .of commemorating Princess Alice's silver wedding and the foundation of the fund by her mother, the late Duchess of Albany. Century Films is making a documentary for the BBC about historical streets in London, and Albury Street is one of the chosen few. They are looking to interview people who have some knowledge of the street and surrounding area. You may even appear in the programme. Deptford has a great history and it would be good to see it publicised. Thanks for the information, and for becoming a follower. I hope you find the website interesting. I have been in the process of moving homes and have not been as busy as I should have on the site, but should be adding more interesting things soon.